Chevrolet ( , of Swiss origin) (also known as Chevy ) is a brand of automobile produced by General Motors Company (GM). Founded by Louis Chevrolet and ousted GM founder William C. Durant on November 8, 1911, Chevrolet was acquired by General Motors in 1917. Chevrolet was positioned by Alfred Sloan to sell a lineup of mainstream vehicles to directly compete against Henry Ford's Model T in the 1920s, and continues to hold its position as General Motors' highest-selling brand to the present day, with "Chevrolet" or "Chevy" being at times synonymous with GM. In North America, Chevrolet offers a full range of automobiles, from subcompact cars to medium-duty commercial trucks. Louis Chevrolet was a race-car driver, and William Durant, founder of (GM), had been forced from the management of GM in 1910. He wanted to use Chevrolet's designs to rebuild his own reputation. As head of Buick Motor Company, prior to founding GM, Durant had hired Chevrolet to drive Buicks in promotional races. Chevrolet first used its "bowtie" logo in 1913. It is said to have been designed from wallpaper Durant once saw in a French hotel. More recent research by historian Ken Kaufmann presents a compelling case that the logo is based upon a logo for "Coalettes". Others claim that the design was a stylized Swiss cross, in honor of the homeland of Chevrolet's parents. In HI, Durant was in the process of setting up Chevrolet production facilities in Toronto, Canada . Later that year, during a luncheon meeting in New York with "Colonel Sam" McLaughlin, whose McLaughlin Motor Car Company manufactured McLaughlin-Buick cars, it was agreed that Chevrolets with McLaughlin-designed bodies would be added to the Canadian company's product line. 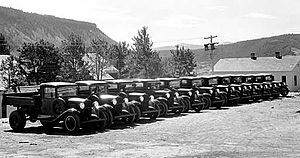 Three years later, the two Canadian operations (Chevrolet was by then a part of GM in the United States) were bought by GM to become General Motors of Canada Ltd.
By 1916, Chevrolet was profitable enough to allow Durant to buy a majority of shares in GM. After the deal was completed in 1917, Durant was president of General Motors, and Chevrolet was merged into GM, becoming a separate division. In the 1918 model year, Chevrolet introduced the Model D, a V8-powered model in four-passenger roadster and five-passenger tourer models. It also started production of a overhead valve in-line six. Most cars of the era had only low compression flat head engines. These cars had 288in3 engines with Zenith carburetors and three-speed transmissions. Chevrolet had a great influence on the American automobile market during the 1950s and 1960s. In 1957, Chevy made the first fuel injected engine. In 1963, one out of every ten cars sold in the United States was a Chevrolet. The basic Chevrolet small-block V-8 design has remained in continuous production since its debut in 1955, longer than any other mass-produced engine in the world, although current versions share few if any parts interchangeable with the original. Descendants of the basic small-block OHV V-8 design platform in production today have been much modified with advances such as aluminium block and heads, electronic engine management and sequential port fuel injection, to name but a few. Descendants of the small-block V-8 in the form of the LT V-8s, and had influence in the design of the LS V-8s, both of which are still installed in Chevrolet vehicles. The original small-block design is simplistic compared to the overhead-cam V-8 that Ford Motor Company used and continues to use in its line of larger cars and light trucks. Depending on the vehicle type, Chevrolet V-8s are built in displacements from 4.8 to 8.1 litres with outputs ranging from to as installed at the factory. The engine design has also been used over the years in GM products built and sold under the Pontiac, Oldsmobile, Buick, Opel (Germany),Hummer and Holden (Australia) nameplates. Mexico has a mix of Chevrolet models from different GM brands and platforms but branded as Chevrolet. The variety of models comes from Chevrolet USA, Opel Europe, and other origins.Examples of Opel Sourced vehicles are the Vectra, the Astra, the Meriva and the Captiva. Mexico also has some cars of its own, such as the Chevy C2, which is a reworked previous generation Corsa. Vehicles based on US platforms are the Avalanche, the Suburban, the Equinox, the Tahoe, the Cheyenne (which is similar to the Silverado but with minor differences), the Aveo, the HHR, the Traverse, the Malibu and the Corvette. The Chevrolet Optra, assembled in South Korea by GM Daewoo, is also sold in Mexico. The European Epica is sold as a Business only vehicle. In South Africa, Chevrolet was GM's main brand name until 1982, with a number of Vauxhall Motors and Holden derivatives being built under the Chevy name from 1964. In the 1970s, the advertising jingle "braaivleis, rugby, sunny skies and Chevrolet" (adapted from the US "Baseball, Hot Dogs, Apple Pies and Chevrolet") came to epitomise the ideal lifestyle of white male South Africans. Holden in Australia used the jingle "Football, Meat Pies, Kangaroos and Holden cars". Originally, Chevrolets were CKD kits of US models assembled in their plant in Port Elizabeth . However, since South Africa was right-hand drive and the US was left-hand drive, along with encouragement by the South African government to use local content, Chevrolets such as the Biscayne were eventually made entirely in South Africa, along with GM's "own car for South Africa": the Ranger. Chevrolet is among the newest brands in India launched by GM's India operations. Until June 6, 2003 (the official birthday of Chevrolet), GM India (which was originally a joint venture with Hindustan Motors) sold the Opel Corsa, Opel Astra, and the Opel Vectra. The Corsa and Astra were built at a plant in Halol , Gujarat . In the Middle East, Chevrolet-badged cars, trucks, SUV's, and crossovers are sourced from GM Daewoo (in South Korea), GM in North America, and GM Holden (in Australia). The Middle East market has a separate division called Chevrolet Special Vehicles (CSV), which (as of December 2007) sources the high-performance CR8 sedan from Holden Special Vehicles. In Pakistan , Chevrolet introduced its cars in collaboration with a local automobile manufacturer called Nexus Automotive. The current lineup available from Chevrolet Pakistan includes Chevrolet Optra, Chevrolet Spark ,Chevrolet Joy,Chevrolet Aveo, and Chevrolet Colorado. The company plans to add Chevrolet Captiva, and Chevrolet Epica to its lineup in the future. In Russia , various Chevrolet models are available. Current Chevrolets include theSpark,Aveo,Lanos,Lacetti,Rezzo,Epica,Captiva,TrailBlazer,and Tahoe. All of these models (with the exception of the TrailBlazer and Tahoe) are rebadged Daewoo models. Chevrolet-branded vehicles are not sold in South Korea . However, many global-market Chevrolet vehicles are sourced from GM Daewoo of South Korea. General Motors is currently exploring cost cutting options as part of its restructuring plan. One of these options involve expanding the Rayong, Thailand plant to add additional capacity to export Colorados to the U.S. This would allow the Shreveport, Louisiana plant to be closed (where the Colorado is also produced). This scenario is plausible only if a free-trade agreement is signed between the U.S. and Thailand, as the American tariff on imported pickup trucks from non-FTA countries is currently 25%. The United Auto Workers is the most vocal opponent to a change in the tariff structure. Even though the Australian market of today mainly consists of Australia's own automotive companies alongside Asian and European automobile brands, Australia once had its fair share of American cars as well. Bodies for the local assembly of Chevrolets were built in Australia as early as 1918 and by 1926 the newly created General Motors (Australia) Pty Ltd had established assembly plants in five Australian states to produce Chevrolet and other GM vehicles using bodies supplied by Holden Motor Body Builders.The merger of General Motors (Australia) Pty Ltd with the troubled Holden Motor Body Builders in 1931 saw the creation of General Motors – Holden’s and the ongoing production of various GM products including Chevrolet. GMH departed from traditional US body styles with the release of the Chevrolet Coupe Utility in 1934 and the Chevrolet “Sloper” Coupe in 1935. Post-war production recommenced in 1946. From 1949 Australian Chevrolets were to be locally assembled from components imported from Chevrolet in Canada although local production of the Coupe Utility body continued until 1952. 1968 was the last full year of Chevrolet assembly in Australia. Vintage Chevrolet models such as Bel Air, Impala etc, are still found in many states around Australia. From 1998 to 2001 the Chevrolet Suburban was sold in Australia as the Holden Suburban. Today several of Chevrolet's designs are based on their Australian counterparts (GM Holden). Chevrolet Europe is a Swiss-based firm (in Zürich ) that mainly sells cars produced by GM Daewoo. Until 2005, Chevrolet Europe sold a few models, mostly United States domestic market (USDM) models modified to suit European regulations. Among them were the Chevrolet Alero (which was a rebadged Oldsmobile Alero) and the Chevrolet Trans Sport (which was a Chevrolet Venture with the front end of the Pontiac Trans Sport). Among other models sold by Chevrolet Europe were the Camaro, the Corsica/Beretta, the Corvette, the Blazer, and the TrailBlazer. The current generation of North American-built Chevrolet Impala V-8 sedans has also been available in Europe in recent years, marketed as both large family sedans and more economically-priced alternatives to Jaguars and BMWs as high performance executive cars. It was in 2005 that all the mainstream models from GM Daewoo were rebranded as Chevrolet in Europe (The ownership of the SUV models in the former Daewoo range had reverted to ownership of SsangYong Motor Company by this time). However the Daewoo name was retained in South Korea and Vietnam . In the rest of the world, most Daewoo models have worn the Chevrolet badge since 2003. Exceptions include the use of the Suzuki badge in the United States and Canada , the Pontiac badge in Canada , the Holden badge in Australia and New Zealand , and the Buick badge in China for certain GM Daewoo models. The Corvette and Cadillac are marketed in Europe through a separate distribution channel operated by Netherlands-based Kroymans Corporation Group. Kroymans Corp is seeking court protection from creditors. Kroymans Corporation also sells Ford, Opel, Nissan, Saab, Volvo and other brands in Germany, the Netherlands and Belgium. Kroymans is going to concentrate only on the importing, distribution, marketing and car retail sales in the Netherlands. Because the Chevrolet brand now represents value-driven cars in Europe, the Corvette name was made into a separate marque for Europe and Japan. In Brazil , the Chevrolet Opala was based on the German Opel Rekord from the late 1960s, continuing in production until the early 1990s, when it was replaced by a version of the Opel Omega. Other smaller Chevrolets in Brazil, such as the Kadett and Monza, were based on the Opel Kadett and Ascona respectively. Chevrolet's product line-up in Brazil now comprises some exclusive designs like the Corsa "B" based Celta sold in Argentina under the Suzuki brand, the Astra, and a brand new, Brazilian designed Vectra based on the current Opel Astra, while the current Corsa is built and the Omega name is now used on the Holden Commodore. Utility and four wheel drive vehicles line-up includes the S10, the Blazer, and the Montana. The Montana is a compact pickup truck, based on the Corsa, that is also sold in other Latin American markets. From the 1960s to the mid-1980s, there was also a large station wagon, derived from the C10 truck (somewhat similar to the Suburban), called the Veraneio. In Venezuela , Chevrolet has been operating since 1948, when truck production began in Caracas . In 1979 production moved to a plant in Valencia that was purchased from Chrysler. Chevrolet assembled more than 1,500,000 vehicles in its first 50 years in Venezuela. Since the early 1920s, Chevrolet cars and trucks were marketed in this country. The Master Deluxe Sedan of the late 1930s was considered to be a pinnacle of luxury. All cars sold through the local dealer, Neal and Massey (also franchisee for Vauxhall and Buick), were right-hand-drive, and imported from Canada and Australia. Throughout the 1940s and 50's, GM maintained a market presence with the Bel Air, Impala and Fleetline. During the late 1960s and early 1970s, Australian Holden DeVilles badged as Chevrolet Caprices were sold, though a few "Islander" limited edition American Chevrolet Caprices were imported. Neal and Massey gave up the GM franchise in 1974 and the brand left the market. During the period 1998-2001, Southern Sales Ltd. imported the Chevy Monza and Joy. Based on the Opel/Vauxhall Corsa platform and assembled in Mexico, these were the cheapest new cars available. Poor build quality, unprofessional dealer service, and a limited spare parts supply saw these cars exit the market with only a few units being sold. In 2003, the local Renault dealer, marketed the Aveo sedan and hatchback, as well as the Optra sedan (a rebadged Suzuki Forenza) with limited success. A more intensive marketing campaign by the latest Chevrolet dealer, Lifestyle Motors, has met with more success. The models available as of 2009 are the Chevrolet Colorado (a rebadged Isuzu D-Max pickup assembled in Thailand), Spark (a reinvention of the defunct Daewoo Matiz), Aveo, Optra, and a rebadged version of the Holden Commodore. When the Second World War broke out the operations were complicated. In 1941 the Chevrolet 250.000 is made, but the shortage of products made car production impossible.The last Chevrolet goes out of the plant in august, 1942. In order to avoid the total stoppage, the company made electrical and portable refrigerators and car accessories amongst other items. After the war, GM started producing the Oldsmobile and Pontiac lines and later Chevrolet is added. In 1959, manufacturing plants are enlarged and set up to produce cars, pick ups and trucks. On 25 January 1960 the first Argentinean pick up Chevrolet is introduced. The following year the national government approves the investment plan for 45 million dollars which included a plant of 12,000 m2.On 12th march 1962 the first Chevrolet 400 is made based on the North American Chevy II. The original plan considered a national integration of 50% during the first year of production, this amount must get to be 90% in 1964 with a production of 15,000 units. By 1969, the Chevy line, derived from the American Chevy Nova is presented. In Colombia Colombian Automotive Factory SA (Colmotores), founded in 1956 and initially produced vehicles in Austin and the 60s, Simca automobiles and Dodge (manufactured its first car was a Coronet 440), began producing Chevrolet cars in 1980. Currently Colmotores has more than 75% of the domestic market, with models from GM Daewoo, Suzuki and Opel. Particularly worthy of mention is the Aveo, Optra and the Spark. [[File:2008 Chevrolet Volt hatchback (concept) 02.jpg|thumb|250px|Chevrolet Volt]]The Chevrolet brand is currently undergoing a product restructuring in North America along with all other GM brands in order to fit into the parent company's turnaround efforts and to rebuild GM. General Motors has recently been in development to make more fuel efficient Chevrolet branded vehicles in order to compete with companies like Toyota and Honda. The Monte Carlo, discontinued in 2007, is said to be replaced by the Camaro, also a coupe. At the 2009 Detroit Auto Show, the production version of the Chevrolet Spark was displayed under the nameplate of Spark. General Motors announced that the Spark, along with the Chevrolet Orlando, would go into production in the US. The Orlando will be a successor, but it is unknown what car it will replace. Along with the Spark and Orlando, General Motors will introduce two more models: the plug-in hybrid 2011 Chevrolet Volt; and the 2011 Chevrolet Cruze, successor to the Cobalt. Chevrolet is starting a second generation Aveo which will make make release summer of 2010. See the U.S.A. in Your Chevrolet (1950s-1960s), sung by Dinah Shore as the theme song to The Dinah Shore Chevy Show.